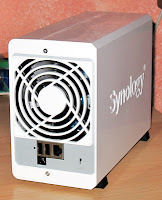 I was looking at Synology Nas from long time. I knew that if I waited enough, they would release the right Nas, with the right spec, at the right price. And 2 weeks ago this time went. 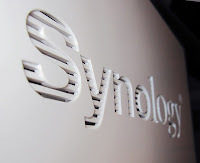 And I placed an order for my new Nas, the Synology DS213j. I also ordered the HDD for the Nas: 2 Western Digital RED 3Tb HDD (WD30EFRX). 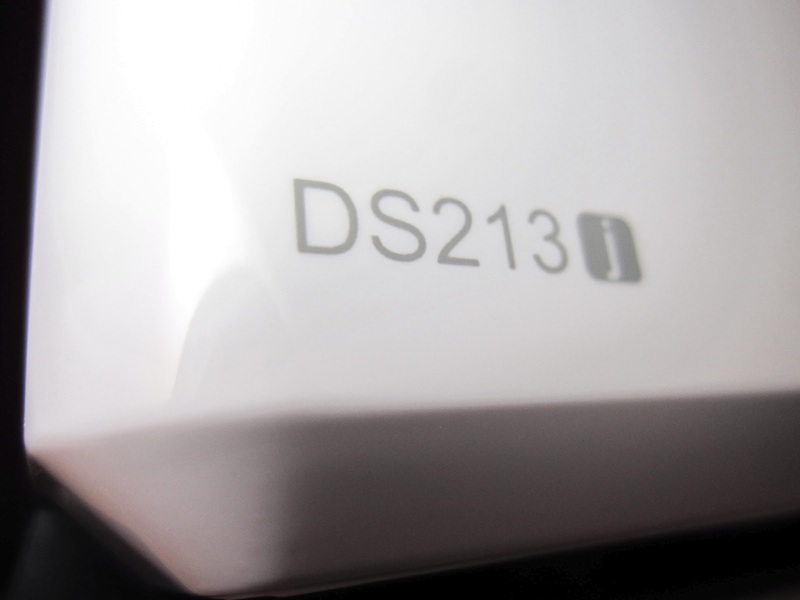 Now, one of the reason that pushed me toward the DS213j was one of its specs: a power consumption of 19W when working, and a very low power of 3.65W in HDD hibernation. The 3.65W in HDD hibernation is very important, because I use my home PC mainly in the evening (19..24) so for the big part of the day (00..19) the NAS will be sitting idle. Now, if the NAS is powered on 24h/day, even a tiny power consumption will build up. So, based on my utilization profile, I can calculate the impact on the electricity bill. Let's try to asses how much will cost to run a DS213j 24h/day for a year. For each day I have about 5 hours of active utilization, and 19 hours of Nas sitting idle. 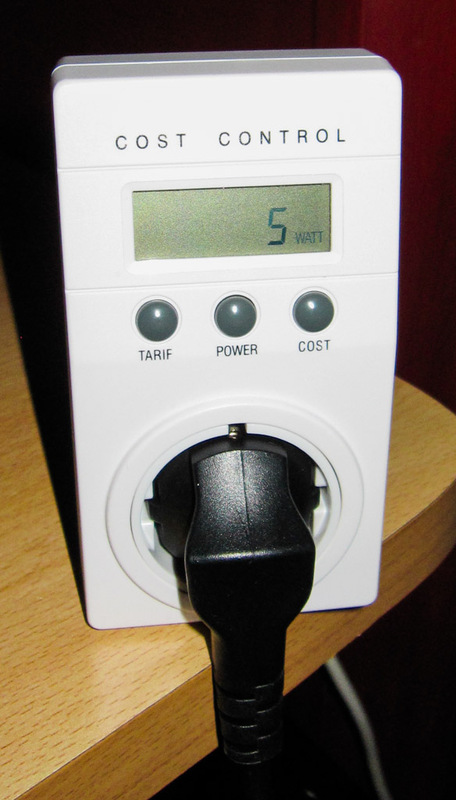 You can't ignore 82kwh / year. I bought 2 Western Digital RED 3Tb HDD (WD30EFRX), to use in RAID 1 configuration. 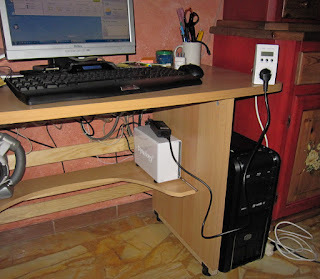 The PC (i7-3770k overclocked @4.5Ghz, 16Gb ram, ASUS P8Z77-V Deluxe, SSD Intel 520, bla-bla-bla-yada-yada.... :-) ) and the NAS are connected via a Netgear WNDR 3700v2 gigabit router (not shown in the photo, it's hidden over the furniture :-) ). 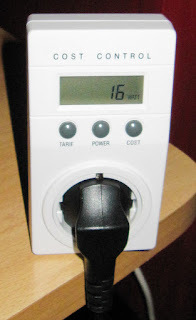 The DS213j power consumption test. In the screenshot you can see the statistics in the DSM, I was copying a single big 10Gb file from the Nas to my PC, the data is being copied at a rate of about 71Mb/s. DS213j power consumption during data writing operation: the power consumption is stable at 17w. Finally, DS213j power consumption during HDD Hibernation: ...wait for it... wait for it... 4w! Eureka! It works (as expected)! Just 4w! Here I don't have a DSM screenshot for the HDD in hibernation state, because accessing the DSM will wake up the HDD. 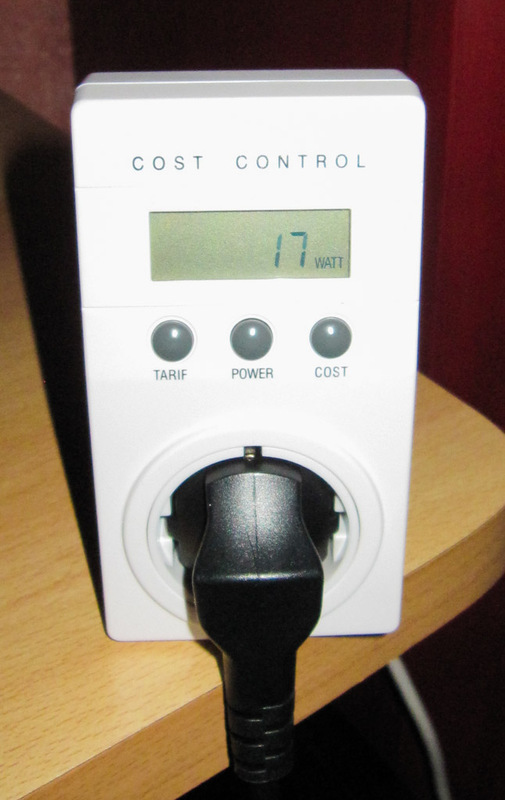 As requested by a commenter, I've tested the power consumption during a scheduled power off. 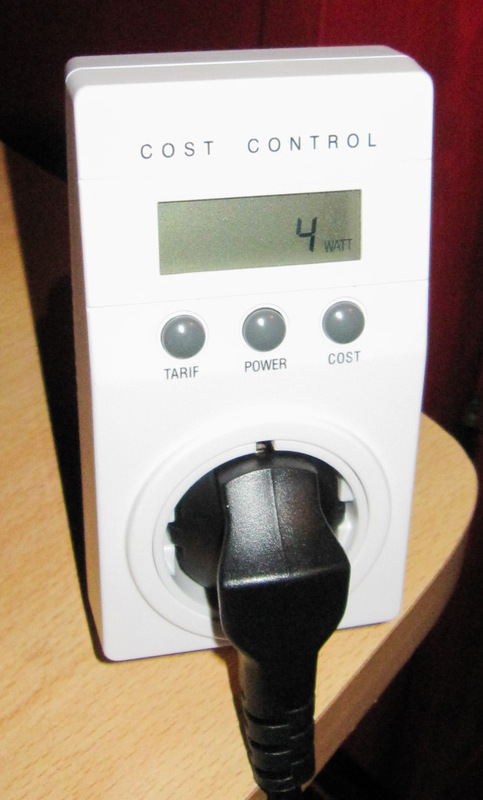 After a scheduled power off the DS213j consume 0W , so it's effectively turned off. Keep in mind that a scheduled power off will have a bit of delay. On my DS213j, when I schedule a power-off at 15:00, the DS213j will effectively power-off at 15:01.47, about 1 minute and 47 seconds later than the scheduled power-off . 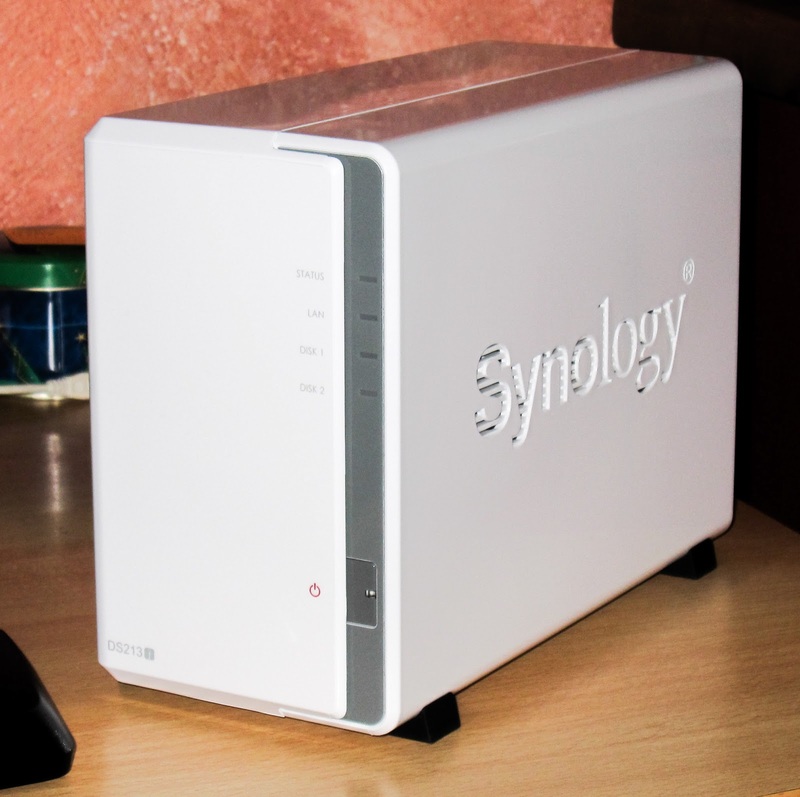 Instead, if you request a power off with the Nas GUI, it will effectively shut-down in about 47 seconds. On DS213j you can activate the WakeOnLan function. When the WOL function is active you can Power On your DS213j via the network. 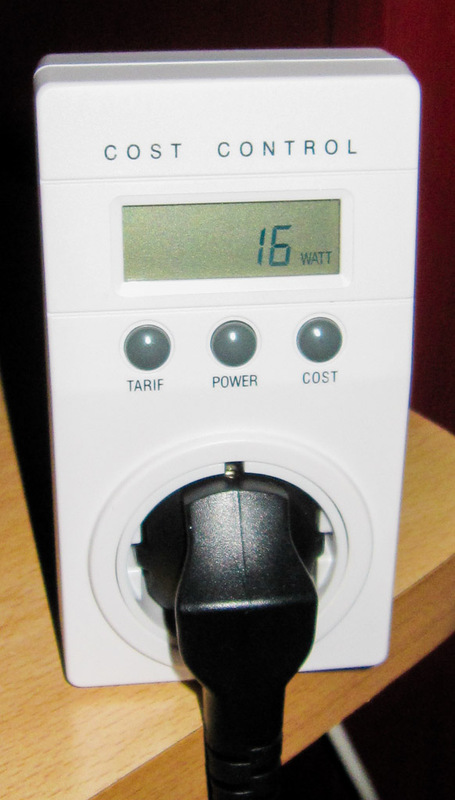 If the WOL function is active, and the DS213j is powered off, the power consumption is still 0W. After activating the WOL function I used a free utility (Depicus wolcmd command line) to test it, and the Wake On Lan worked perfectly. How much time will take a backup? My first full backup (850Gb of data on more than 700'000 files.) took about 10 hours. I made it using SyncBack. Your mileage will vary wildly (depending on files size, files count, software used...). How much time take to sync data with Cloudstation? I started today to use Cloudstation to sync about 8.5Gb of data (about 18'000 files) it took about 6 hours to sync (upload) all the data from my PC to the NAS. Your mileage may vary. The maximum Cloudstation upload speed I've seen (from PC to NAS) is about 8Mb/s, when transfering a single very big file (2Gb). Update: After updating the nas to DSM v4.3 the Cloudstation got faster, now it upload data (from PC to NAS) at about 11Mb/sec (on very big files). How much space will use the Cloudstation sync service? If my preliminar understanding are correct, it take AT LEAST two times the size of the data you want to sync. Do you want to sync 10Gb of data? For these 10Gb of data, Cloudstation will employ at least 20Gb of disk space on the NAS. But It can use much more than 20Gb of space, because by default Cloudstation save the last 32 versions of any synced file. So If you edit often a 100Mb file, this may occupy up to 100Mb*32 = 3.2Gb of space on the NAS. Why the free space on the NAS doesen't increase when you delete some files? If these file are these file synced via Cloudstation, you need to remove the file from the cloudstation history/recycle bin. Log in the NAS using the account of the user using the sync service (the admin user wont works), then: Open CloudStation, open the Recycle bin, Select the synced shared folder, and remove the old files. Why the free space on the NAS, still, doesn't increase when you delete some files? Are the deleted files in a shared folder that have the recycle bin enabled? Log in in the NAS as administrator, open control panel, open the shared folder list, then click "Action" and you'll be able to click "Empty all recycle bins" (for all shared folders) . The TimeBackup package WILL NEED a "dedicated" volume as a destination for your backup. This have some implications: you will need to do a planing, do some test, and decide beforehand how much space you are going to dedicate to the TimeBackup function, then you will create a volume of the needed size. I used 3Tb HDD in Raid 1, these are effectively about 2780Gb of total space. I've create a Volume1 of 2000Gb, and a Volume2 of 780Gb. The Volume1 will contain the shared folder for my data. The Volume2 will contain the shared folder I will use as a destination of the TimeBackup function. On Synology DSM, you can grow a volume (if you have free space) but you CAN'T shrink a volume. So, I have 2 volumes: Volume1 = 2000Gb, and volume2 = 780Gb. If I want to grow Volume1, The only way is to delete volume2, then grow volume1, then recreate volume2. You CAN'T shrink volume2, even is it's totally free and unused. This mean that if you want to use the TimeBackup function, you need to think carefully about how to size your volumes. During my testing I discovered a tiny quirk of the WOL feature. 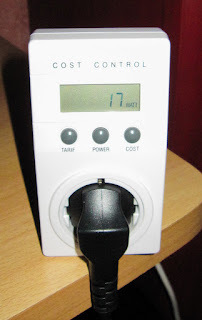 If you power-off the DS213j 'normally' (by the GUI, or by the button) the WOL function will work perfectly. But if the DS213j is powered off, and you detach it from the power, the WOL function get 'deactivated', and wont work. In this situation, to power on the DS213j, you need to push the button. 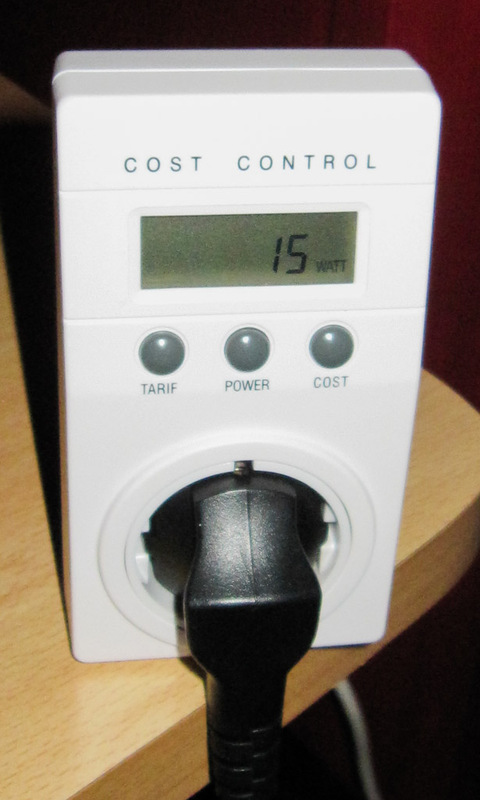 Clearly the WOL function still use a very tiny bit of power, and unplugging the power cable disable the WOL function. I've tested the files transfer speed between the Nas and a smartphone over a WiFi network. The Galaxy S4 link speed: 150Mbps. The test: I downloaded 6,89 Gbytes of data (1534 files) from the Nas to the internal memory of the Galaxy S4 using the DSFile App. The DSFile App is setup to use an HTTP connection. I think this is s not bad at all, after considering that it's a real data-transfer speed over WiFi for a smartphone. 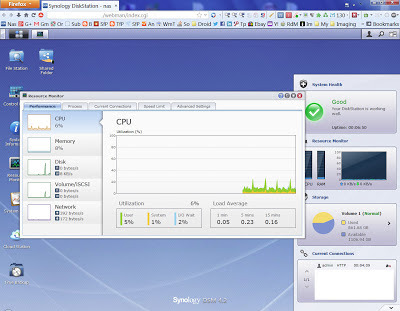 The network transfer speed reported y the Nas Resorce Manager oscillated between 2MBytes/sec and 8MBytes/sec. The maximum speed is clearly limited by the WiFi connection, and/or by the smartphone. I'm very happy about my brand new DS213j, I love the DSM and it's packages. I'm also very happy about the HDD choice, using a pair of 3Tb WD RED the maximum power consumption is about 17W when writing, 15W when idle, and less than 4W during HDD hibernation.